Mudflows are somewhat of a misnomer, because these volcanic flows include not only mud, but debris ranging up to boulder size. The term, however, has been commonly applied to water-saturated volcanic flows and is well entrenched in the literature. The Indonesian word lahar refers to mudflows in volcanic terrain. Lahars can occur both during an eruption and as secondary flows long after an eruption is over, as rainfall remobilizes volcanic ash deposits. Lahars have lower velocities than debris avalanches formed by volcanic landslides, but can travel long distances beyond a volcano, inundating large areas in low-lying terrain. The most catastrophic lahar in historical time took place on 13 November 1985 at Nevado del Ruiz volcano in Colombia, when a lahar struck the city of Armero in the dark of night, catching people unawares and causing more than 21,000 fatalities. Extremely destructive along the axis of the flows, at the margins lahars can passively enter houses through openings without destroying the building. After emplacement of a mudflow, dewatering can cause the deposit to harden almost like concrete. 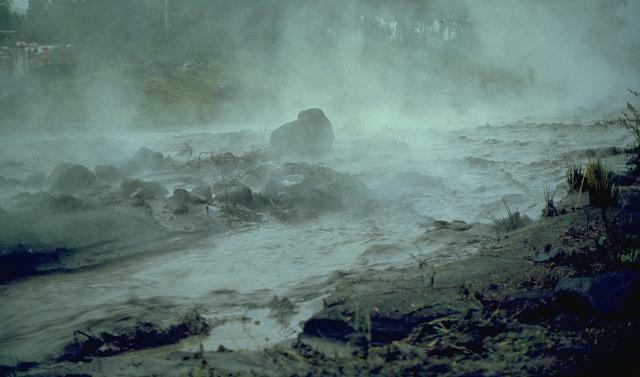 A hot lahar sweeps down a channel on the SW flank of Mayon volcano in the Philippines on September 14, 1984, five days after the onset of an eruption. The water temperature of this lahar was about 80 degrees Centigrade. Note the large block in the center of the channel that is being transported by the lahar. Photo by Ernesto Corpuz, 1984 (Philippines Institute of Volcanology and Seismology). 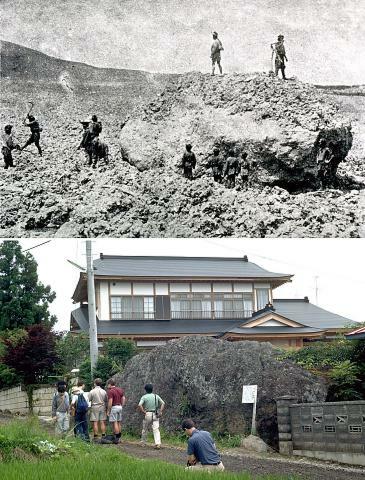 This massive boulder (top photo) was carried down the Biwasawa valley on the east side of Bandai volcano in a mudflow during an eruption in 1888. The mudflow deposit covers the broad floor of the Nagase valley. In addition to this mudflow, the 1888 eruption included a pyroclastic flow on the east side and catastrophic debris avalanche that swept over villages to the north of the volcano. The bottom photo is taken from the same location a century later. The identical boulder now forms part of the landscaping of a house in the town of Inawashiro. Top photo by Fukushima Minposha Newspaper, 1888; bottom photo by Lee Siebert, 1988 (Smithsonian Institution). 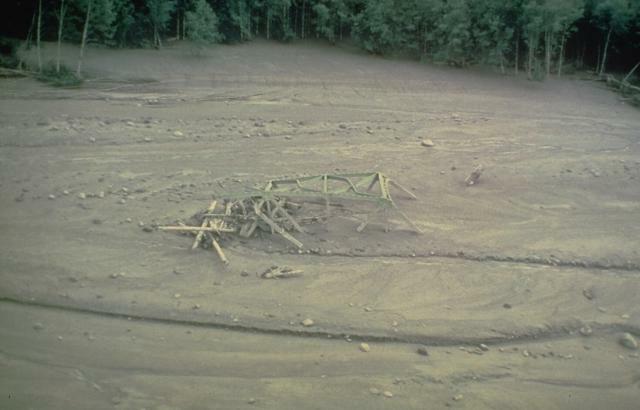 The twisted girders of a highway bridge lie entombed in mudflow deposits from Mount St. Helens. This May 18, 1980 mudflow was produced by dewatering of the debris-avalanche deposit in the North Fork of the Toutle River and traveled as far as the Columbia River, decreasing the depth of the navigational channel from 11 meters to 4 meters. 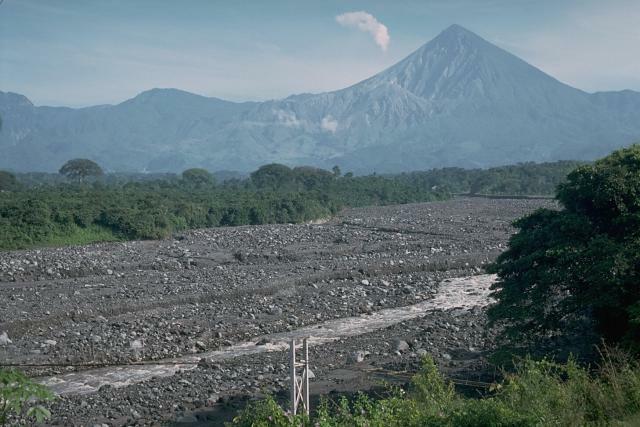 Lahar deposits produced by redistribution of material shed off the Santiaguito lava dome, visible below the steam plume to the left of Guatemala's Santa María volcano, have had dramatic effects on downstream drainages. This December 1988 photo shows the Río Tambor, SW of Santa María, filled bank-to-bank with debris. Bridges such as the one in the foreground have been frequently destroyed during rainy-season lahars, which have traveled 35 km or more from the volcano.